Art Nouveau will be covered over two weeks. First we'll have a general introduction and cover several regional variations, then we'll cover the other regional variants next week. 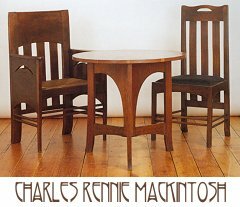 Charles Rennie Mackintosh (1868-1928) in Glasgow, Scotland, preferred the strength of the rectilinear line. Interestingly though, he also used Celt-derived patterns from sources such as the Irish Book of Kells (800AD) to appeal to national sentiment and pride. Key works: architecture, interior design and furniture for Glasgow Art School & Library; several Tearooms for Kate Cranston. 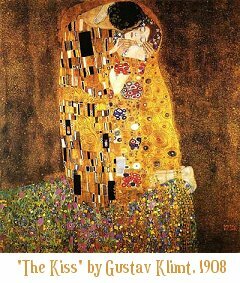 He was influential to Viennese style. 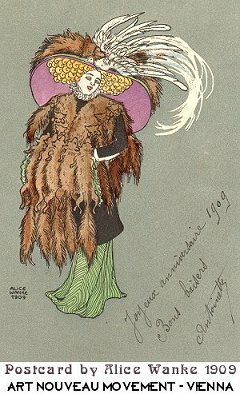 Archibald Knox was a designer for Liberty & Co, mentioned in the Aestheticism page. 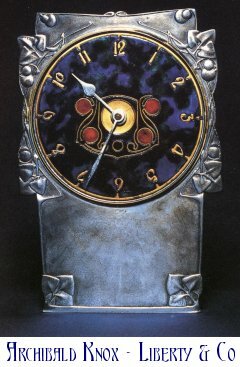 During this later period, he designed distinctive metalwares for Liberty, including the Tudric Range of pewterware such as the clock shown here. He also designed jewellery with similar organic embellishments of twisting vines. 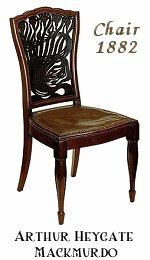 Liberty & Co were such leaders in the Art Nouveau Movement that the style was actually known as "Stile Liberty" in Italy, after the London company. 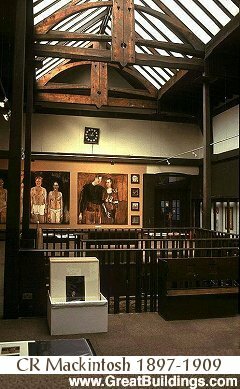 As you can see by these examples, not all Art Nouveau in the UK was the rectilinear style of the Glasgow School. 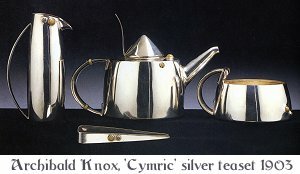 These English examples by Knox are are curvilinear, with hardly a straight line to be found in any of the pieces. 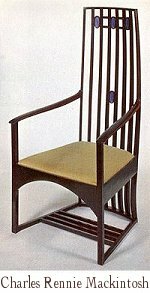 Art Nouveau in Austria was known as Sezessionstil or the Vienna Secession. One of the foremost of the Guilds was the Wiener Werkstätte (Vienna Workshop). 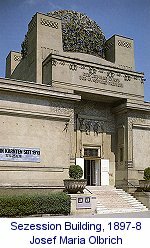 The Wiener Werkstätte (also spelled Wiener Werkstaette) produced a wide range of products: furniture, fabrics, fittings & furnishings, ceramics, metalware, jewellery, glass, fashion and bookbinding. 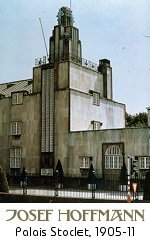 In the later years, the designers and architects developed their style into Art Deco (see later lectures). 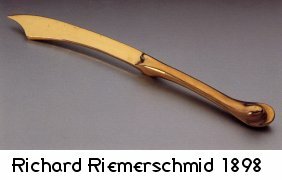 The Rectilinear line was dominant in both Austrian and German Art Nouveau. Architect and town planner, one of the founders of the Vienna Secession. 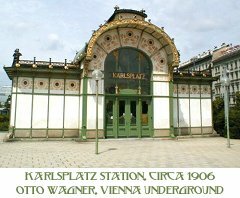 One of his great achievements is the Vienna Underground which he designed and helped to build. A number of the original buildings from the Vienna Underground still stand. 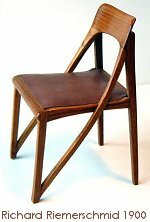 He also made some very clean, rectilinear funriture such as this armchair. Painter and designer, the "Master of Viennese Modernism". One of the founders of the Wiener Werkstätte. Also spelled Joseph Hoffman. An architect who along with Moser was one of the key founders of the Wiener Werkstätte. 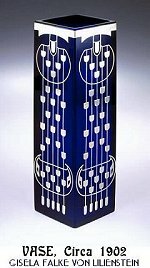 Hoffman designed a wide range of items including architecture, furniture, utensils, clothing, bookbindings, posters, textiles, and wallpapers. He was very influenced by William Morris and the ideas of Ruskin and the Arts & Crafts Movement in the UK. Architect of the Secession Building. Wiener Werkstätte designer. 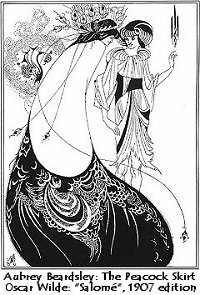 Some of her designs were strikingly modern. Art Nouveau in Germany was known as Jugendstil. German Art Nouveau has been called the Birthplace of Modern Design. 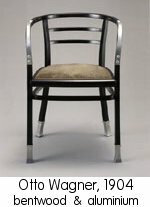 The Deutscher Werkbund was founded in 1907 to advance the quality of Industrial Design, and it is from this foundation that the later Bauhaus style developed - which is probably the most important school in the history of object design. Germany was never involved in the anti-mechanisation Arts & Crafts Movement, and had no philosophical problem with the idea of mass production. 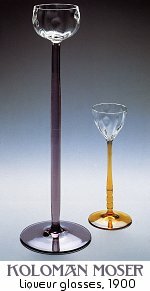 Jugendstil tended to use geometric forms and undecorated surfaces. 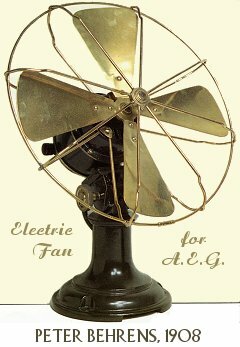 Peter Behrens (1868-1940) designed many style-setting electrical appliances. His students included Walter Gropius, Mies van der Rohe and Le Corbusier, who would later become the "three giants of 20th Century design". 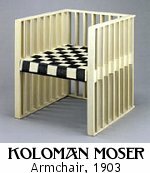 Jugendstil architect and designer, one of the founding members of the Deutscher Werkbund. 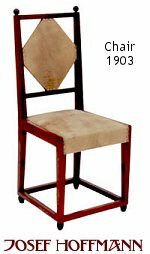 This chair was exhibited at the Paris World Fair in 1900.